The first meeting of the OP Model United Nations club was on a warm September day in the Bain Building, a motley crew of young Oratory gentlemen shepherded by Mr. Kearns and Mrs. Otterbein-Yoo gathered to discuss the birth of a new club. 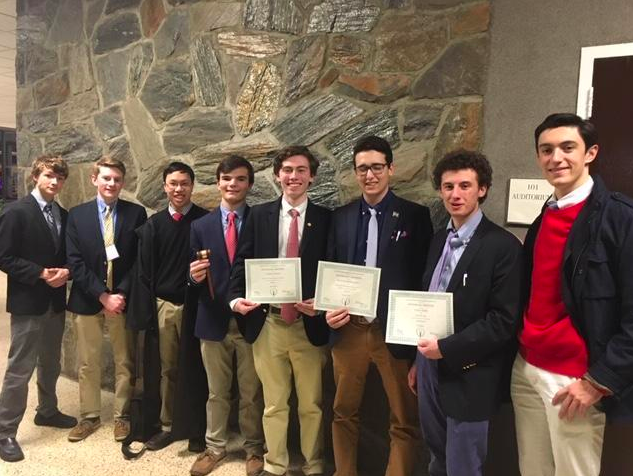 Our own founding members are now seniors as they fondly look back on their years in Model UN. Justin Oei, one of our founding seniors who has been instrumental to the development of the club, said that, “Model UN has been a formative experience for my high school years, and watching it develop and bloom into the program it is today has been just amazing.” Justin along with Rocco Rodrigues and Tommy Gress, has maintained an impeccable ethic when researching conferences and making sure new members are prepared. One such new member has now won best delegate at Academy Model United Nations after being prepared for his first conference, an achievement of which the entire club is extremely proud. Richard Williams, the junior who emerged from a conference room at Bergen County Academies victorious, now accounts his experience, an experience he never expected to turn out so well. Using both researching, orating, and social skills Model UN members work towards solving current global issues. Either through cunning manipulation and political maneuvering or through a genuine passion to solve the issue genuine success is difficult especially when competing with more rigorous programs. Despite the relative youth of our program, we can count many of our members as successful, a fact of pride. The future of Model UN at Oratory is bright. The influx of new members, as well as our senior members, bodes well for the 2019-2020 year. That as well as the potential for overnight conferences and maybe even hosting one of our own one day, speaks volumes to club evolution.